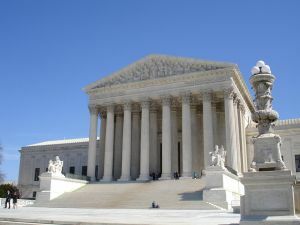 Insurance companies are pleading with justices in the U.S. Supreme Court to consider forcing class action cases to federal court, arguing that plaintiff lawyers artificially lower the monetary amount sought in order to keep the cases in the more claimant-friendly state courts, versus the more business-friendly federal courts. Our Boston mesothelioma lawyers know that a decision probably won’t have a major impact on asbestos litigation, as most of the recent cases filed are done on an individual basis. It wasn’t always so. A little history: Back in the early 1990s, when an overwhelming number of asbestos lawsuits were first being filed, judges began to recognize the difficulty that would result from trying to manage them all. In 1991, federal asbestos cases were all consolidated into one that would be heard in the U.S. District Court for the Eastern District of Pennsylvania. Soon after those cases were transferred, the Center for Claims Resolution, comprised of a group of asbestos manufacturers, worked closely with plaintiff lawyers to certify a class and propose a settlement. They were successful, and the settlement became known as the Georgine v. Amchem Prods., Inc. This decision involved the establishment of a priority system of handling claims – unimpaired plaintiffs versus impaired plaintiffs (or those who had been diagnosed with mesothelioma and those who had not yet). It then set up a tier system for payouts. However, the U.S. Supreme Court later broke up the class, saying it was too large and involved too many varied interests. Plaintiffs’ common points of fact were too few, the court found. Since then, federal courts haven’t tended to favor class action with asbestos cases. There was another attempt in 1999 with Ortiz v. Fibreboard Corp., but the high court again declined to certify the class. Asbestos class actions do exist, but anyone who joins one should carefully weigh their options with a private mesothelioma attorney first, as your case may be strong enough to warrant a much larger amount of compensation than you would receive by jointing a class. The current case before the court involves a practice that the insurance companies claim is common: the artificial limitation of class members and damages sought in order to keep the case in state courts. A federal law passed in 2005 indicates that any class action over $5 million is automatically forwarded to federal courts, but anything under that can remain in the state’s jurisdiction. In some cases, attorneys for the insurance firms argue, attorneys are getting around the current law by filing multiple class action cases in different districts, each under $5 million. Insurance lawyers say that this strategy prolongs litigation unnecessarily and makes the potential payout so high that it forces them to settle, even in cases that may not be as strong. Still, moving all class action cases to federal court then puts plaintiffs at a potentially unfair disadvantage. A decision by the Supreme Court justices on this matter is expected by spring.